Caution: This page is under construction. I still have to describe the latter part of this trail. 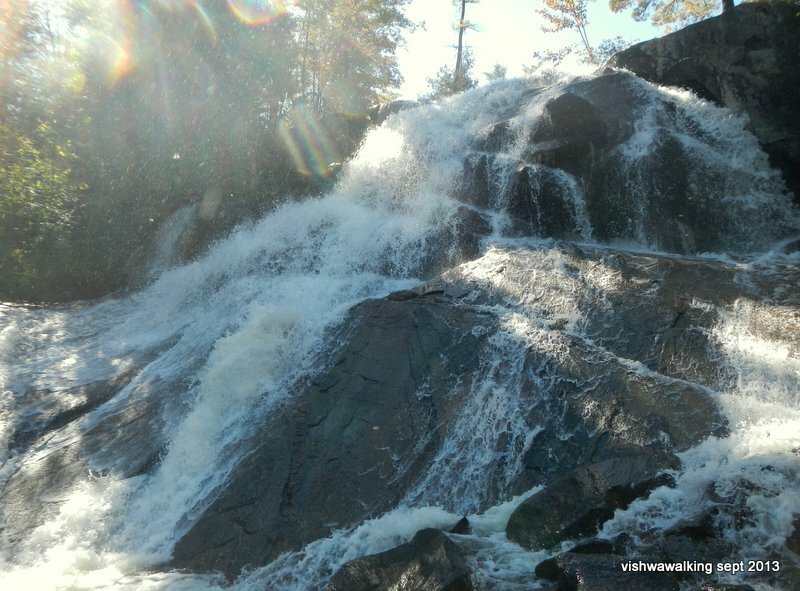 This collection of trails has lots going for it, but the big prize is High Falls between Stratton and High Falls Lake. It is stunning. A photograph cannot do justice to this incredibly beautiful falls. Above the falls is a natural rock waterslide. 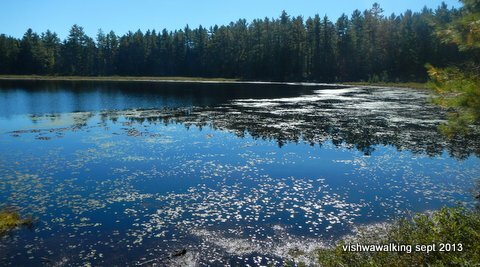 This is one of Algonquin Park's gems. Bring your swimming suit if you are there on a beautiful summer or fall day. There are several loops on this set of trails that will allow you to pick and choose how much or little you want to do. I walked the whole set in one day, but similar to the Higlands Backpacking Trail, I don't recommend that. I reckon there are about 21.3 kilometres of trail. Add in some diversions to campsites, a couple of necessary backtracking on trails, and general tramping around, it's easy to put in a 26+-kilometre day as I did. But let's be more reasonable. 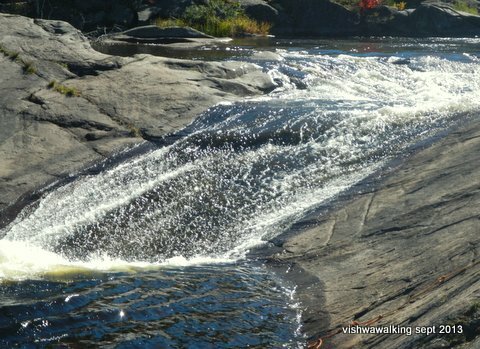 If you just want to get to High Falls and hang out, the shortest hike is along the south shore of Johnston Lake, followed by the northern shore of Stratton lake. That's 17.6 km for the trip out and back. 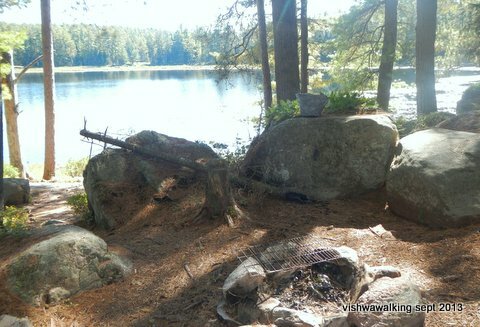 More interesting is a turn around Berm Lake and then around Bucholz Lake for a 19.6 km hike. That gives you more variety and you get to see the Glacial Boulder Gardens at the north end of Bucholz. You can cheat and walk in from the Barron Canyon Road. There's a clear path from an unmarked parking lot (west of the Brigham lake portage parking lot, I believe, but I didn't travel it so I'm doing a bit of guessing). It's roughly 3.5 km one way to the falls. Shorter walks that don't take in the falls include a loop around Berm Lake (4.3 km) and a longer loop around Berm and Johnston lakes (10.7 km). After that, you might as well take the big loop that takes in the falls. I'll describe that and add the shorter walks in as we go along. Stratton Lake—Johnson Lake—Achray parking lot. But for a 1.3 km stretch to get to the falls, there are no repeats on this trail; it's a true loop. 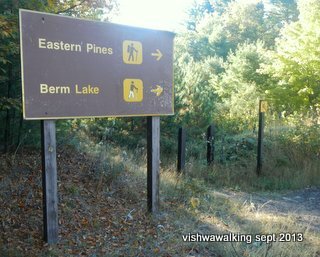 The signs are clear at the east end of the parking lot; walk past the sign and turn left to loop around Berm Lake. The sign announcing the start of the trails. After that, you'll walk around some potentially marshy bits (although it was quite dry on the fall day I did this trail) and Berm Lake will soon appear on your right. With all the marsh, I wondered about the mosquitoes in other seasons. At least one site I visited spoke of the "vicious mosquitoes in late June." 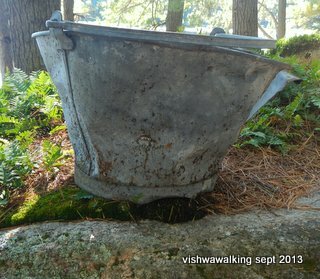 I experienced that viciousness on Algonquin's Highland trail in August. In late September, the weather was glorious and there was a distinct and delightful absence of bugs. At the north end of Berm Lake the trail rises and there is a nice cliff overlooking the lake. 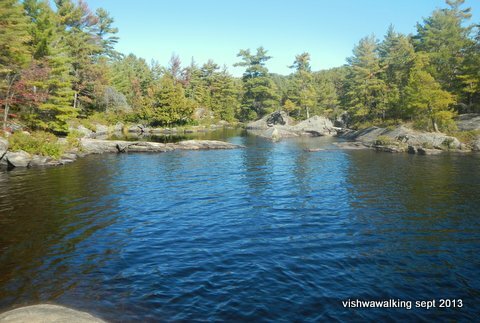 At the three kilometre point, the trail; heads off to the south end of Johnston Lake. However, if you are just out for the short 4.3 km walk mentioned above, you can continue around Berm Lake and back to the parking lot. Another option is to take this turn at the 2.4 mark as if you were heading back, but cut off left (east) at about the 800 metre mark along the connecting trail trail along a trail that leads to the Johnston lake campsites. This sidetrail is 1.9 kilometres long and you'll probably add more if you wander around inspecting the campsites. The more direct route is half a kilometre, so you're adding at least 1.4 km to your walk this way. If you take this option, you'll find that the sidetrail moves just north of the campsites, parallel with the lake. Before the last campsite, it heads north through young hardwoods back to the main trail. The campsites (there are five of them strung out along the shore) are close to the water relatively flat and pretty straightforward. There are thunderboxes set back in the bush (also known as boom boxes, or—boring—"pit privies"). etc., just a line between two trees, but definitely a plus. Back to the main trail: If you took the sidetrail, you'd be 500 metres along the main trail from the first (2.4 km) junction. Continue east until you get to the junction of trails at the end of Johnson Lake. Here you can make more decisions. You can turn right (or, rather, it's more like straight on), go 0.2 km and turn right (west) at the junction and do a 10.7 km loop around Johnston. Alternatively, head left after walking the 0.2 km to travel along the northern shore of Stratton Lake to the High Falls cutoff. Including the 0.2 connection trail, that's 5.3 km. Finally, you can turn left (north-east) up the hill following the sign pointing to Buchholz Lake. That's a 6.1 trek to the sidetrail that leads to High Falls. By taking option two (along Stratton Lake), you save yourself yourself 0.9 km. However, you'd miss the Bucholtz Lake glacier garden. That's worth an extra kilometere for sure. Also, if you go the Stratton Lake route, you'll have to retrace your steps. 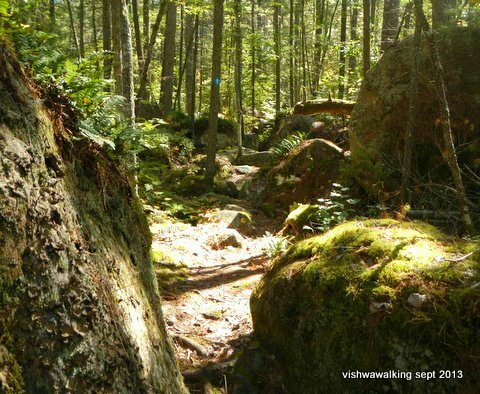 Glacial Boulder Gardens of Bucholtz Lake. 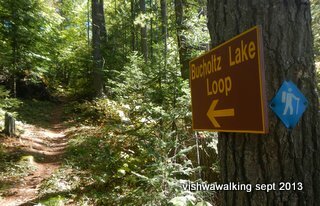 We'll assume you want to go on to Bucholtz Lake. So up the hill you go. 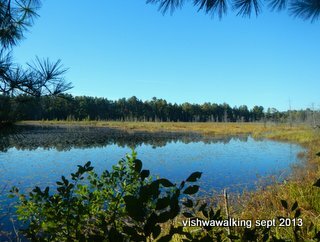 Here the trail winds through bog and pine until finally, beyond some marsh, Bucholtz Lake come into view. As you get closer, the ground gets increasingly rockier, until you are clambering from rock to rock and winding by some pretty large bounders. 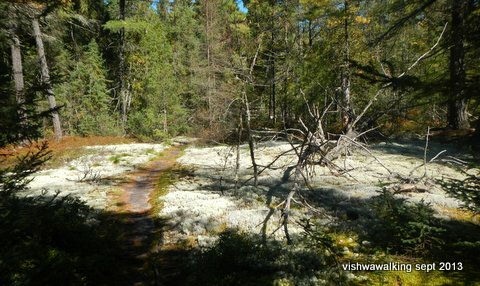 Above: just before you get to Bucholtz lake, a bed of lichens spreads out on both sides of the trail and the forest opens a bit just before the glacial rocks begin. 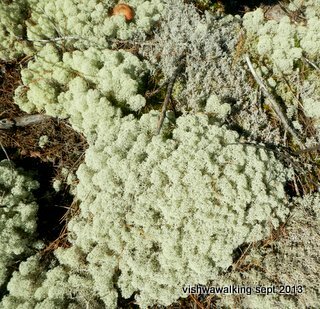 Right: a closeup of the lichen beside the trail. 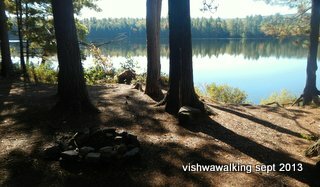 As you get near the lake, a single campsite appears. It's quite cozy, surrounded by rocks and has a good view of the lake. Right: Bucholtz lake looking south. The southern ends is reedy, but this serves to highlight the dramatic glacial boulder garden at the northern end. As you move around the lake, the glacier garden to the north is tantalizing. You are walking in the "garden," but a good portion of it is under water. It's a beautiful sight and a good place to pause for a while. 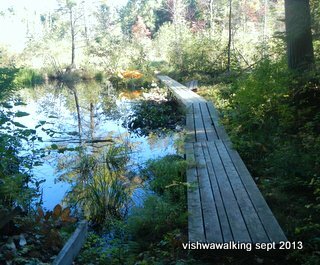 Left: the section of the "Glacial Bolder Garden " that is in the marsh and water at the north end of Bucholtz Lake. Left: At places, the boulder-laden soil is not enough to hold trees and their roots hang dramatically in and around the rocks. As the trail drops south and comes in close to the east side of Bucholtz Lake the trail crosses or runs near the site of an old lumber camp. I saw no trace of this, but perhaps I missed a clue or two along the way; perhaps too much has been filched from the site by unscrupulous walkers. You'll soon see a sidetrail off to your right (to the west) that leads to the campsites on Stratton Lake. There are four here, reserved for hikers; further south there is a string of eight more sites for canoeists strung along the north shore of the narrow eastern channel of Stratton. There are even more further to the west on the more open part of the lake. Roughly 400 metres from the main trail junction (where the trail branched to the parking lot), you'll have a choice. You can continue along the shore to the head of the top pond. You can wend your way toward the falls from here, but it's best done if you are willing to swim a bit or at least wade. I didn't do this; I headed off to the left to cut over to the falls. There are multiple trails here and all I can say is that you must find a trail that gets you up on one of the ridges that will take you first to get a view of the "jacuzzi." This is a wide flat slab of rock over which a rush of water plunges to a shallow pond. I say shallow because it looks deeper — as though a swimmer would slide down the rock and plunge into a deep ledge with a possible undertow, like a human-made dam. Luckily, this isn't so. I watched four guys howling in delight as they slid down the rock. I would have tested the jacuzzi myself, but no one was there when I had time to swim and although it is pretty safe, doing the slide on my own would have been foolhardy. Finally, you must make your way to the top of the falls. It's an ideal lunch spot. I also clambered to the bottom, although this takes a bit of climbing and figuring out. There are various ways to get to the bottom, all with differing degrees of difficulty/danger. the jacuzzi), down toward High Falls, which is at the top point of the pond. This description is incomplete. I will complete this page in a few days. Stay tuned.